A glorious 1870’s taupe silk bustle back bodice. The bodice has recently been de-accessioned from a museum collection and the cataloging tag is stitched inside the neckline. The bodice is lavishly trimmed with pleated ruffles. The sleeves have a wide flared flounce that is trimmed with a silk bow. The back of the bodice is also trimmed with ruffles and bows. It has a center back peplum. The bodice is in very good condition. There are no splits or holes in the fabric and no underarm discoloration. The bodice appears to have never been worn. Bust 36 Waist 26. Antique clothing is for display and should not be worn. 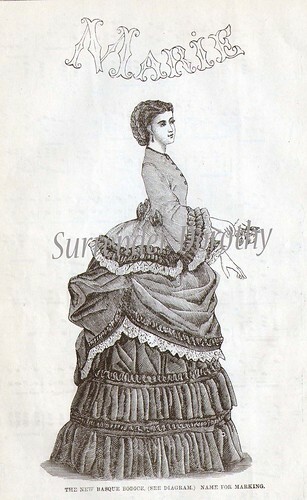 About is a fashion plate from 1871 to give you an idea of what the skirt would have looked like with this type of bodice. Is it just me, or are museums releasing an awful number of garments? A few years back, a lot of museums shut down and sold off their inventories. I keep seeing some of the same gowns/outfits pop up - very often with different sellers- because of that.